Before the emperor of the NBA leaves his Olympic Tower office, this is the holy war that those within the San Antonio Spurs' extended family expected David Stern to eventually wage on Gregg Popovich and his program's culture. The commissioner burped that terse, threatening statement promising "substantial sanctions" to the rogue state of his totalitarian nation on Thursday night. This has been a long time coming out of the commissioner's office. And yet, once more, Stern's tossed a temper tantrum that left everyone around him embarrassed, humiliated and wondering why he insisted on staying until February of 2014. All these years, Stern and his underlings privately complained and moaned that no one wanted to watch the Spurs, that they destroyed his TV ratings, that they were uninteresting, unappealing and impossible to market to the masses. And now, this act of condemnation for Popovich – which resulted in a $250,000 fine for San Antonio handed down by the league office Friday evening – would be bathed in the ultimate of twisted irony: Without the Spurs' stars, Stern was selling that the NBA logo had been desecrated, that a public trust had been betrayed. Suddenly, Stern had to issue an apology to NBA fans because Popovich sent his stars home to San Antonio at the end of a long road trip. No one in Miami bought a ticket to watch Tim Duncan and Tony Parker and Manu Ginobili, because those players are relevant to no one in Miami. Mostly, they come to watch LeBron and D-Wade, or they don't come at all. Few people watch the Spurs on national television – unless they're playing the Heat or the Los Angeles Lakers – and that's because the Spurs never deliver the dysfunction and self-destructive bents that fuel the sport's storylines. 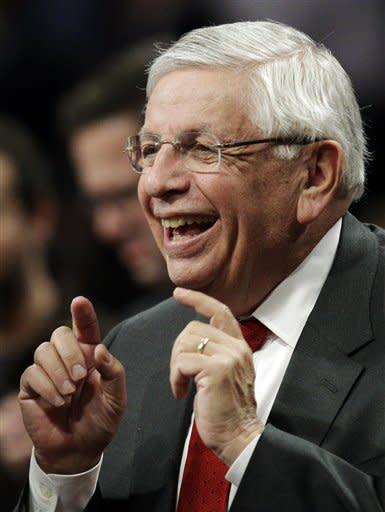 Stern once declared that his fantasy NBA Finals would be the Lakers vs. the Lakers, and no one laughed in San Antonio because they understood Stern was stone-cold serious. And well, if there was a little "Bleep You" out of Popovich toward Stern after shipping his players back to San Antonio after five games in seven nights, it was beyond understandable. Back in the Spurs' glory days, it was one disrespectful act after another out of Stern. The Spurs don't forget how the NBA's vice president of operations, Stu Jackson, directly called Bruce Bowen to warn him about how he was playing defense and threaten him with future punishments. Jackson didn't show the respect of reaching out to Spurs officials before communicating with Bowen, but bypassed them and got into the heads of one of their most important players. Phil Jackson himself couldn't have orchestrated it better on behalf of the Lakers' Western Conference championship chances. They don't forget how one of Stern's top public-relations officials went out of her way to try to dissuade an NBA team owner from hiring a well-regarded Spurs executive as general manager. And they don't forget that once that executive got the job, she went out of her way to try to undermine his operation. They don't forget how Stern wanted to infiltrate the inner sanctum of the Spurs with TV cameras and microphones, with the kind of phony, superficial behind-the-scenes access that went against how the franchise conducted its basketball business and kept its edge. The Spurs have been a model of efficiency and innovation that has been an immense resource for the operations of small- and big-market franchises, but the commissioner can't leverage that on TNT with Ernie, Kenny and Charles. They don't forget how Stern stood by as USA Basketball director Jerry Colangelo publicly embarrassed Popovich. Colangelo went out of his way to insist his close friend Mike Krzyzewski was chosen as Olympic coach because, in part: "I think [Popovich] had a bad taste in his mouth regarding his most recent experiences with USA Basketball, some bitterness, and that came out in my conversation with him. He seemed burned out by it. … He just wasn't as enthusiastic as Mike." There's a double-standard to how this league operates under Stern, and it won't change until Adam Silver takes over and makes it a priority to do so. When Yahoo! Sports uncovered a pattern of deliberate predraft rules violations that benefited the New York Knicks and penalized the rest of the teams, Stern did little. Brandon Rush blew out his knee in an illegal workout, Wilson Chandler was stashed for weeks in Atlanta so no one else could get access to him before the draft, and Stern fined that Cablevision empire essentially lunch money for a weekend shindig in the Hamptons with the Dolans. Teams had talked about these violations for years and complained to Jackson's office. Brandon Rush said the NBA had never once contacted him before the Y! Sports' investigation. For two years, the charges went uninvestigated. Had the Spurs been caught doing this, there likely would've been a loss of draft picks, suspensions and millions in fines. And rightly so for the Knicks, Spurs, or anyone who tried to get away with those things. That's the double-standard that Stern runs in the NBA. In that instance, here's a possible reason for the way the NBA never acted dutifully on its flagship franchise. The scout responsible for running those workouts? Rodney Heard. How did Heard get into the NBA? Jackson, as general manager of the Vancouver Grizzlies, hired him. Rival teams were always suspicious Heard conducted those illicit workouts on the Grizzlies payroll, too. If Rush told me about blowing out his knee as a Kansas undergraduate with the Knicks conducting an illegal workout – and then hiding it – wouldn't he have also told league investigators the same had they pulled him into their Manhattan offices and demanded the truth? Stern never apologized to the paying public about allowing his franchise with the most resources to get away for years with this behavior. He fined them $200,000 – $50,000 less than he fined the Spurs for sitting their players – fined Heard $25,000, but never made an example out of them. The Knicks affected competitive balance, and it didn't matter that New York remained horrible. No one gets a lighter sentence for robbing a bank and dropping the money on the way to the getaway car. Stern doesn't care about the realities of his league, just the appearances. To him, the appearance on Thursday night was that Popovich had tried to embarrass him on national television and that's why the commissioner tossed that tantrum. Apologize to the fans? In a league where the mere appearance of players on the floor doesn't guarantee preparation and effort, the Spurs never cheat the public. They're honest, in a way so few are honest. When too many others wear the uniform and yet still take the night off, the Spurs come to play – or they don't come at all. In every way, Popovich let his players be the stars. He never self-promoted. He's never done endorsements. Stern wanted a players' league, and Popovich gave him the ultimate players' program. It was team, team, team. Only, Stern couldn't market it. He hated it. Four times they reached the NBA Finals, and Stern didn't like the TV ratings of those series. 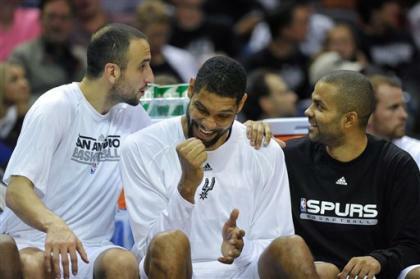 For all of his so-called marketing genius, Stern could never sell the global appeal of Manu Ginobili and Tony Parker. They brought the NBA to the corners of the world, glamorized basketball over soccer, and somehow it was Popovich's failure that Stern couldn't market this to people. The NBA failed the Spurs, far more than the Spurs ever failed the NBA. After his fourth championship, I asked Popovich why he never cashed in on all the trappings that come to the immortal coaches. "Listen," Popovich told me, "it's a player's league. I think it's very important for a coach to make sure that his players believe 100 percent – and not with lip service – that it's about them. Coaches are going to do everything they can to create that environment for them. It's not about creating an environment for us. It's a privilege to be able to coach these guys. We make enough money." 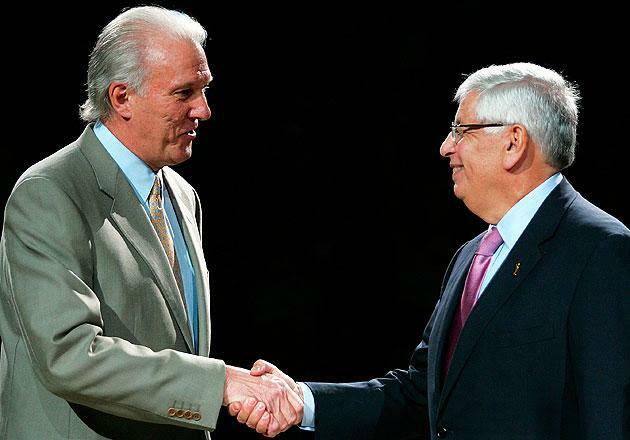 When Pat Riley scored the greatest free-agent coup in NBA history, no one called to congratulate him – except Popovich. This was the kind of power play that should've served to put him out of the championship business in San Antonio, but, still, Popovich admired it. He respected that Riles played to his strengths, Popovich played to his own, and together they would compete for the title. Popovich never tells people that his way would work for them, but it works for him and the Spurs. Against LeBron James and Dwyane Wade, against Chris Bosh and Ray Allen, what the Spurs did in a 105-100 loss wasn't an embarrassment to the NBA, but a celebration of it. This is how a franchise ought to be run, how winning is of foremost importance. Popovich empowered his bench to hang with the defending champion Heat, and gave his group even greater confidence and belief for when they're called upon again. What happened was one of the most compelling Spurs' regular-season games, and easily the most mesmerizing game of this season. This was a testament to the Spurs' great scouting and player development, the great coaching and discipline. This was the ultimate testament to the Spurs' way, and it didn't repulse the paying public – it inspired them. When David Stern issued that belligerent, foreboding statement before tipoff, it was clear he believed the Spurs would get blown out and make his case for him. He never imagined San Antonio would hold the lead into the final minute. Stern could've waited until Friday, delivered his substantial sanctions – a naval blockade on the Riverwalk, a ban on Napa Valley imports for Popovich, whatever – but he couldn't help himself. He wanted to embarrass Popovich throughout that national TV game, and wouldn't you know it: Popovich embarrassed Stern because the Spurs coach has a complete understanding of his realm, his team, his players, in a way that Stern has lost touch with that with which he lords over. The emperor of the NBA wasn't standing up for the fan on Thursday night, but settling an old score on his way out of office, on his way to a February 1, 2014, retirement date that suddenly seems so far away. Even within a league that would've never imagined the core of the Spurs dynasty could stay on top longer than the commissioner who wished them away, the expiration date on the emperor still feels so far away. Nevertheless, make no mistake: David Stern wanted these players gone all the way until Thursday night, all the way until they became convenient devices for his failed culture war on the San Antonio Spurs.